Should the academy ever have to be closed due to severe weather we will send an email message to all parents, who are registered and post a message on this page and on the 'Latest News' section of this website on the homepage (panel to the left). We will inform local radio stations, including BBC Wiltshire and Heart FM. Please ensure that your contact details are up to date. If the weather is severe, please check your emails (if registered) and the homepage of this website, to make sure we are open before making your journey to school. If there is no message on the website, please assume that the academy is open. The main path leading from the main entrance to the school building is gritted for pedestrian access. 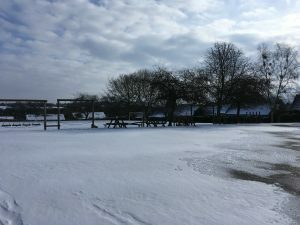 In addition to this, a pathway from the car park to the breakfast club entrance will also be gritted for pedestrian access for children being admitted into breakfast club. We will not be gritting the alleyway leading into the main school entrance, so parents and children need to be very careful when travelling through this area. All items should be clearly labelled.